Photograph: Clayton Hauck Pipeworks and Longman and Eagle teamed up on Brown & Stirred, a Manhattan-inspired beer. The Manhattan is hands-down my favorite cocktail—it's boozy and simple, plus (if you're at a good bar), you get the added bonus of a brandy-soaked cherry. 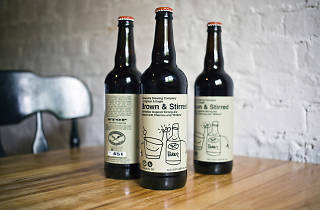 Now imagine that in beer form: Pipeworks Brewing Co. and Longman & Eagle recently teamed up to make Brown & Stirred, a Manhattan-inspired beer. The beer, a strong rye ale, starts out with rye and corn, then lemon peel, cherry puree, bittering roots and aromatic hops are added. The result is a strong beer (it’s 10.5% ABV) that’s pretty perfect for Manhattan fans. We opened a bottle in the TOC office and immediately got a whiff of the cocktail. Once we tasted it, there were a lot of cherry notes, plus bitterness running throughout. It’s not the kind of beer you can down quickly, but you shouldn’t be doing that with Manhattans anyway—sip it slowly, just like the cocktail. 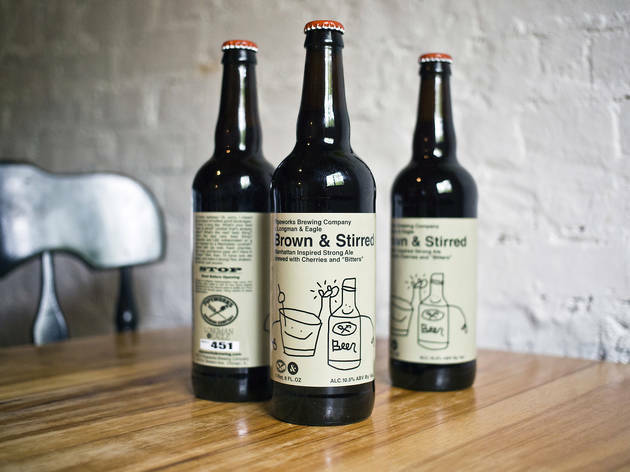 Brown & Stirred is available on draft or by the bottle at Longman, where it’s served over ice with a lemon twist. Half of the beer is hanging out in rye whiskey barrels, and it’ll be put into bottles and kegs later this year. Could this be the start of a new trend? Last fall, iNG teamed up with DryHop Brewers to make Rat Pack, an Old-Fashioned Ale brewed with orange peel, cherry puree and candi sugar. If so, can someone get on a Dark and Stormy–inspired beer, please?